Mercer Juniors Varsity Women’s 8+ at the 2017 Youth National Championship in Sarasota, FL. West Windsor, NJ – The Princeton National Rowing Association’s Mercer Rowing Club had six boats turn in impressive performances at the 2017 USRowing Youth National Championships at Nathan Benderson Park in Sarasota, Florida on June 9-11, 2017. PNRA/Mercer’s women’s youth eight with coxswain (8+) finished seventh in the nation by edging out Nashville at the finish line in the Petite Final. PNRA/Mercer had trailed Nashville most of the race but started walking through their competitor in the final 200 meters of the race. The PNRA/Mercer 8+ crew finished about four seats up and a time of 6:34.78 minutes. “We started our sprint with 400 meters left in the race, which is earlier than we usually start it, but we had to do that to catch Nashville,” said senior coxswain Caroline Galati (West Windsor-Plainsboro High School South). “I kept saying ‘Beat the A Final times’ to motivate them, and we got our split down to 1:30 for the last one hundred meters,” Galati added. A split represents the time required to travel 500 meters or one quarter of the race. Other members of the PNRA/Mercer women’s 8+ included co-captains senior Celia Varga (Princeton Day School) and Laila Shehab (Hunterdon Valley Central High School), junior Katryna Niva (Hunterdon Valley Central High School), junior Emmanuelle Adamson (Princeton High School), senior Katie Lustig and junior Kieran Wild (both from Council Rock North High School), as well as juniors Mia Barkenbush and Sara Hansen (both from West Windsor-Plainsboro High School South). 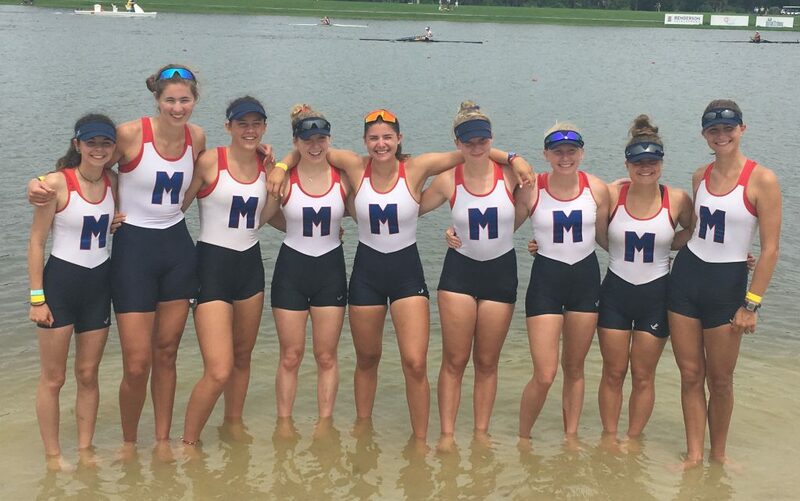 First-year coach girls’ coach Matt Carlsen also saw his women’s youth 4 with coxswain (4+) and women’s youth lightweight 8 with coxswain (lightweight 8+) finish 12th and 15th in the nation. The women’s youth 4+ was a Cinderella story for PNRA/Mercer, as the boat did not qualify for the national regatta during the rainy and stormy Mid-Atlantic Regional Championships in May but received their bid through the petition process. By winning a spot in the Petite Final, the crew showed they deserved their spot. The women’s youth 4+ included junior Peri Mishkin (Allentown High School), senior Grace Wonnell (West Windsor-Plainsboro High School South), sophomore Sarah Closser and junior Bridget Parker (both from Princeton High School) and coxswain junior Lauren Preston (Notre Dame High School). The PNRA/Mercer lightweight 8+ featured senior Sheila Kennedy-Moore (Princeton High School), junior Maheera Bawa (Montgomery High School), sophomore Jacqueline Armetta (Villa Joseph Marie High School), junior Taylor Vierling (Northern Burlington High School), freshman Eveline Enthoven (Princeton High School), sophomore Chloe Couillens (Hopewell Valley Central High School), juniors Julia Berdzik and Erin Dobbs (both from Notre Dame High School) and coxswain junior Maddy Peel (Princeton High School). Justin Ochal in his second year as Mercer Program Director and third year as Boys’ Varsity Coach boys was pleased with the performance of his two pairs (2-). The boys rowed in borrowed boats because their own boats were damaged during a Sarasota thunderstorm when another club’s boats that were not tied down properly were blown onto the PNRA/Mercer boats. Despite this setback, one pair consisting of junior Evan Kinter (Steinhert High School) and senior Lachlan Mersky (Haddonfield High School) finished eighth in the nation and the other pair consisting of junior Andrew Moss and junior Dana Gajewski (both from Princeton High School) finished 13th in the nation. PNRA/Mercer’s men’s youth lightweight 4 with coxswain (lightweight 4+) qualified for the Petite Final as senior coxswain Sarah Brune (Lanoka Harbor, NJ) pushed her crew hard during the qualifying time trial on Friday. For the 2017 Youth National Championships, USRowing altered the regatta format by replacing 2000-meter heats with 1900-meter time trials in the initial round. Some crews found the new format difficult because their spring seasons featured 2000-meter races side-by-side with the competition. Some regatta spectators missed the competitive drama of side-by-side heats and the opportunity to see crews from different regions race each other. Along with Brune, PNRA/Mercer’s lightweight 4+ crew, which finished 12th in the nation, included sophomore Alex Brodowski (Pennsbury High School), senior Enzo Couillens (Hopewell Valley Central High School), sophomore Brady Stergion (Notre Dame High School), and senior Tyler Harris (West Windsor-Plainsboro High School North). The PNRA/Mercer men’s youth 8+ crew finished 17th in the nation. The crew included sophomore Jack Gallagher (Council Rock North High School), co-captain senior Daniel Stoddard (West Windsor Plainsboro High School South), senior Chris Silva (Hopewell Valley Central High School), junior Eli Kalfaian (Delaware Valley Regional High School), co-captain senior Andrew Hickey (Notre Dame High School), co-captain senior Carter Levine and freshman Leon Deng (both from Princeton High School), senior Rex Berger (The Hun School), and coxswain senior Kate Takacs (Princeton Day School). PNRA/Mercer will begin its summer season soon. In addition, many of the PNRA/Mercer rowers and coxswains will assist with instructing new rowers at the club’s renowned summer camps for middle-school and early high-school-aged athletes who wish to get involved with rowing. For more information on PNRA/Mercer summer camps, visit www.rowpnra.org. The Princeton National Rowing Association, a 501c3 organization, operates the Finn M.W. Caspersen Rowing Center located on the shores of Mercer Lake in West Windsor, New Jersey. The Princeton National Rowing Association is dedicated operating a world-class training site for our nation’s elite athletes, providing opportunities for area youth to excel in the sport of rowing and to expand rowing in the greater Mercer County area through community based programs. The Mercer Junior Rowing Program which provides rowing opportunities for the youth from over 25 Mercer County area high schools. The center is a home to the USRowing National and Olympic Teams, as well as rowing clubs and schools, including the Hun School, Lawrenceville School and Peddie School. PNRA received generous support from JLRacing, Holiday Inn and Residence Inn by Marriott. For more information, contact Kristopher Grudt, tel: 609-977-1094, krisgrudt@rowpnra.org or visit www.rowpnra.org. ← JL Summer Store Now OPEN!